There are times when a band’s musical work is really amazing, but the format they use to express their musicality is truly a great and hard trial for a deeper understanding. One of those strange things that can astonish the fans is the strategy inherited by many Metal genres from Progressive Rock from the 70s: the ability to fill one entire album with only one song. Are you astonished with this? 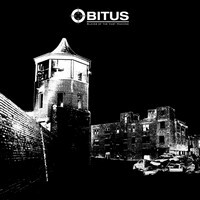 So let the Swedish duet OBITUS lead you into a nasty and brutal voyage with “Slaves of the Vast Machine”, their new album. It’s brutal and oppressive in the way of bands with fast speed in some moments (like GORGOROTH and MARDUK sometimes), but with a brutal technique used on each musical instrument and shrieked growls. But as the song lasts more than 45 minutes, of course there are changes on the tempos, and even some introspective funereal moments. But their focus is really on create something truly violent, but with talent.The album was recorded at Studio H. Manaicus, and being produced, engineered, mixed and mastered by the band itself (with the guest vocals parts being recorded at Tokyo Napalm Holocaust Studios, with the sound engineering done by Cyroth666). This provided the band full control of what they were doing, and the sound quality is truly harsh and aggressive, but with a good aesthetics that make their musical work understandable. Nasty and aggressive, “Slaves of the Vast Machine” has come to put your mind to think. Yes, I know that to pay attention is such long song is really hard. But many bands used long songs as well. Just remember VENOM with “At War With Satan”, EDGE OF SANITY with “Crimson” (maybe the first song in this format on CD era, and this reason, one of the first songs to reach 40 minutes). And the Death vocals were done by the special guest Fredrik Huldtgren. “Slaves of the Vast Machine” is a long song, being aggressive and really nasty, brutal in many points, a bit more atmospheric on others, but always heavy and bitter, but always spewing forth a great amount of energy. It’s a voyage, so take some time to hear it without interruptions to get the whole idea behind it. It’s truly a courageous work, and OBITUS’ guys did a fine job, indeed, so play it out loud.